Learn more about how helicopters can benefit your agricultural operation in Delaware. Aerial applications for agricultural projects, which are both cost-effective and efficient, are on the forefront of agricultural operations. Aerial applications in Delaware enable for crop treatment and protection of essential agricultural supplies. Helicopters allow farmers to access remote areas quickly and with minimal environmental impact. Aerial applications afford flexibility as treatment chemicals can be mixed and loaded directly on the nurse/platform trucks that transport helicopters, which saves time and transportation costs. 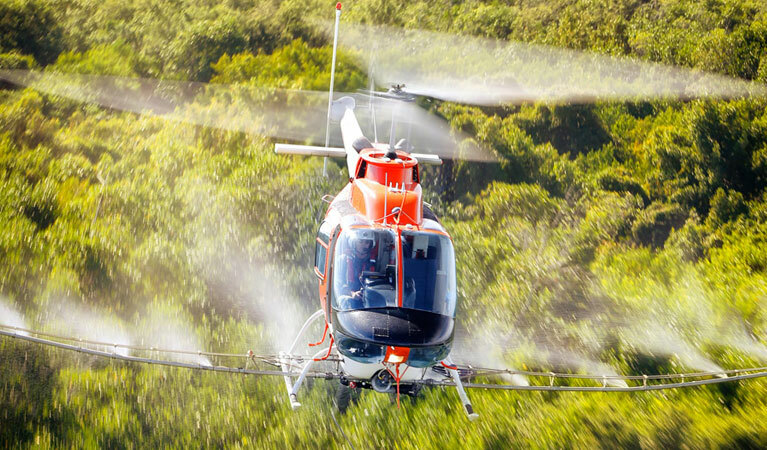 The Robinson R44 and BELL 47, frequently used in helicopter aerial applications in Delaware, are smaller aircraft that carry large quantities of spray, and can be easily transported, saving on fuel costs. FairLifts arranges spray service solutions for farmers and growers in Delaware, and offers additional solutions, such as, crop surveys, line inspections, frost prevention, and more. Our network of experienced pilots hold Growsafe and Chemical handling certifications, and affiliate helicopters are equipped with DGPS to guarantee accurate applications. Farming is Delaware’s leading industry, accounting for $8 billion in revenue each year. Nearly 2,500 farms, which benefit from the state’s rich Greenwich soil, are spread across 510,250 acres of farmland. Greenwich soil is classified as “Prime Farmland Soil,” which means it is one of the most productive soils in agriculture and forestry. The state’s leading crop is corn, which is grown on two-fifths of Delaware’s agricultural land, while apples are the primary fruit crop. Other important crops include soybeans and wheat. Delaware’s agricultural industry includes a variety of companies managed by the state's farmers and ranchers. These include leading processing and packing companies as well as exports. Aerial application in Delaware allows farms to be efficient and productive by spraying and protecting large areas quickly and precisely. 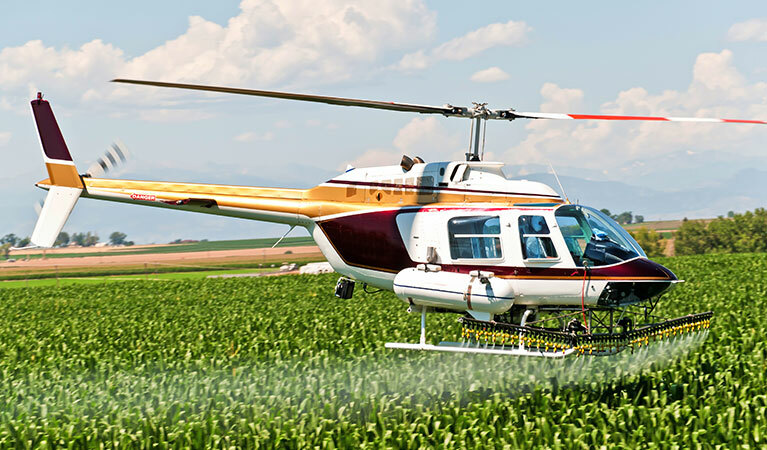 Helicopters can be utilized to spray, treat and protect crops, such as, corn, wheat, grains, vegetables, and fruits, including apples and melons. FairLifts arranges a wide variety of aerial application solutions in Delaware, including crop surveys and dry and wet spraying, treatment and frost protection. Helicopters enable accurate and consistent coverage of crops, working quickly and with limited environmental impact. The advantages include cost-effectiveness, speed, greater harvests and productivity, as well as premium quality products and increased revenues. The following are just some of the solutions FairLifts arranges for aerial application in Delaware. FairLifts books helicopters for a variety of aerial applications, including crop dusting, topdressing, fertilizing, watering or hydroseeding. Our experienced network of certified pilots facilitates numerous services, including mixing of fungicide and crop protection products, as well as aerial application of fertilizer and hydroseeding. Mosquitos and pests can ruin crops, costing farmers millions in lost revenue each year. They also affect the quality and market value of crops. FairLifts network of affiliate helicopters enable cost-effective access to hard to reach fields with limited environmental impact. FairLifts arranges cost-effective and timely aerial applications of herbicides, affording vast areas to be targeted precisely and accurately. Helicopter aerial applications can access rugged terrains and remote areas, facilitating protection from noxious weeds and brush encroachments. The average growing season in Delaware varies from 170 to 200 days, depending on weather conditions. Aerial applications of frost prevention and treatment solutions afford year-round protection even during winter months, FairLifts can easily arrange periodic treatments for extensive agricultural areas. Experts are standing by to get you a fast quote for your agricultural job in Delaware! FairLifts works with the most professional and experienced pilots and operators working in the agricultural aviation industry. Each of our agents is well-versed in assisting farmers in producing higher and better quality yields in Delaware and can assist you in your own growth. Simply contact us seven days a week to discuss environmentally and neighborly crop dusting and spraying this next growing season.